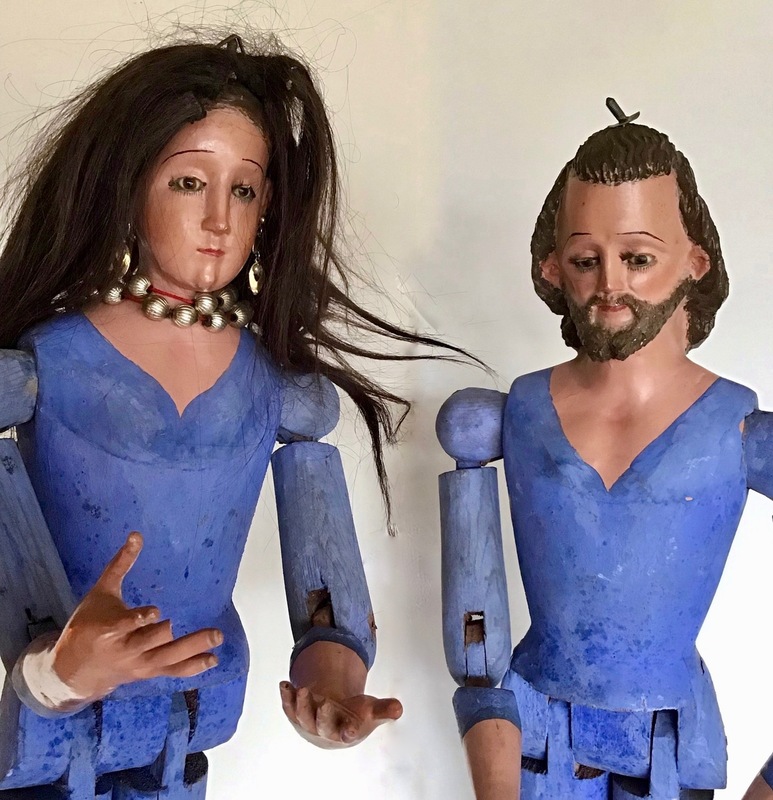 The Corpus Christi celebration in Pujili, Cotopaxi Province, in the Andean highlands of Ecuador, is a syncretic pageant that blends Catholic rites with pre-Hispanic belief systems. It is famous for its costumes and glittering headdresses that are striking assemblages of recycleds objects. 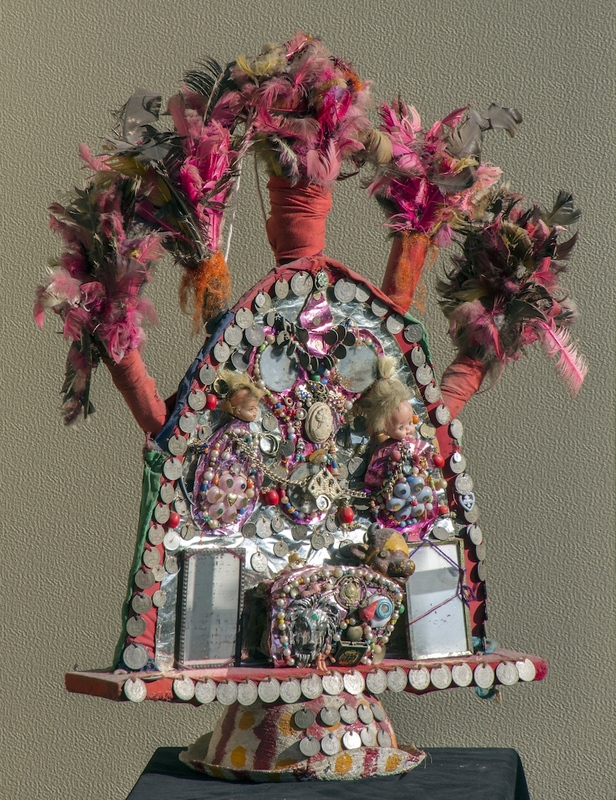 This stunning piece incorporates beads, ribbons, tinfoil, plastic dolls, mirrors, buttons, coins, feathers and more. San Isidro (San Isidro Labrador) is the patron saint of farmers. He is usually depicted plowing a field with a team of oxen. According to legend he was a particularly devout farm worker who was able to fulfill his daily prayers while an angel was plowing the field for him. 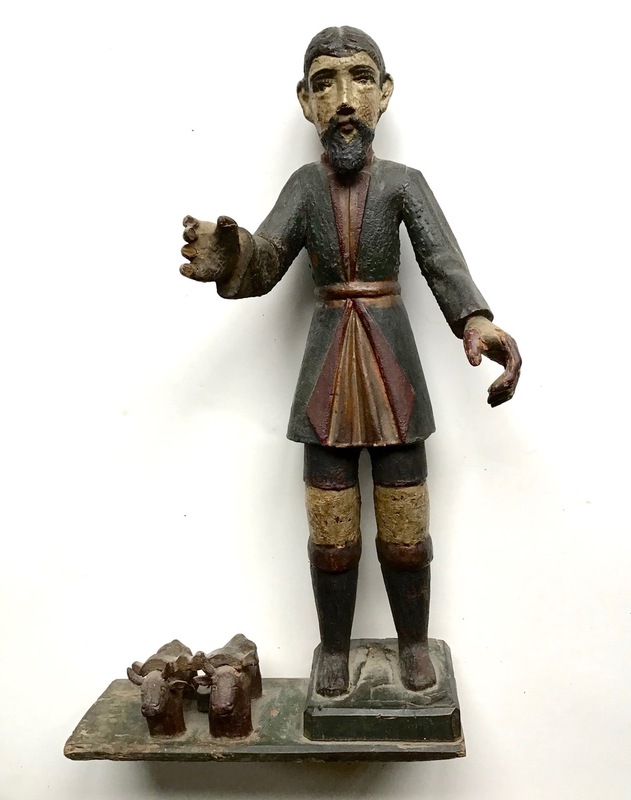 This unique 19th century sculpture shows him in Spanish colonial dress with a diminutive pair of oxen at his feet. It is a superb piece of Guatemalan sacred art from the period. Victor Teodoro Caceres was born in Tilcara in the Province of Jujuy, Argentina around 1940. His native region is a province in Argentina’s remote northwest populated by indigenous Quechua villages and surrounded my desert landscapes and stunning multi-colored rock formations. Spanish colonial traditions are very much alive there today, along with indigenous cults. 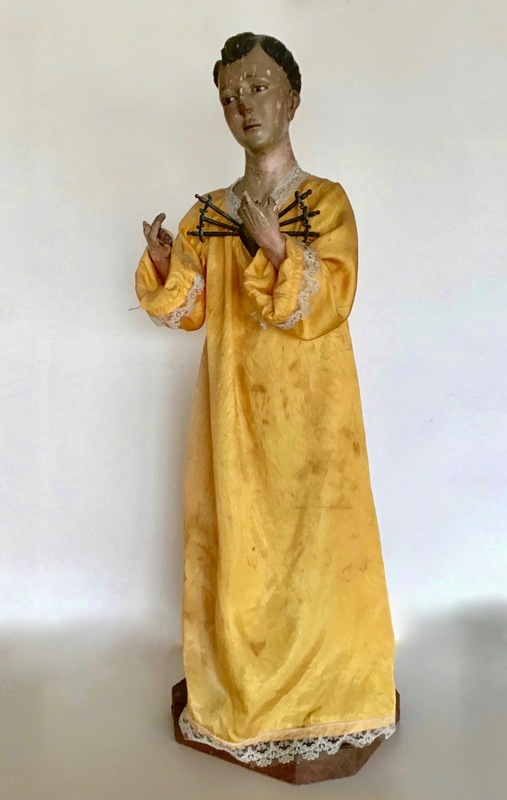 This rare, exquisitely carved figure depicts San Pascual ("El Rey San Pascual"), a folk saint venerated throughout Mayan Guatemala although not approved by the Catholic church. He rules over the graveyward and is believed to cure infectuous diseases. Possibly a composite of pre-Hispanic death figures, he is represented as a skeleton, sometimes wearing a cape and crown and carrying a scythe. 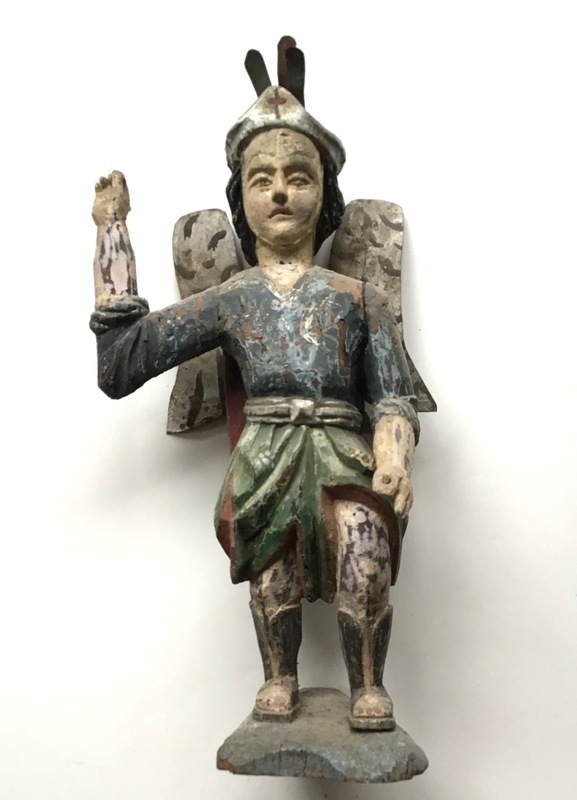 This stunning antique piece is articulated and depicts the saint with all his attributes. 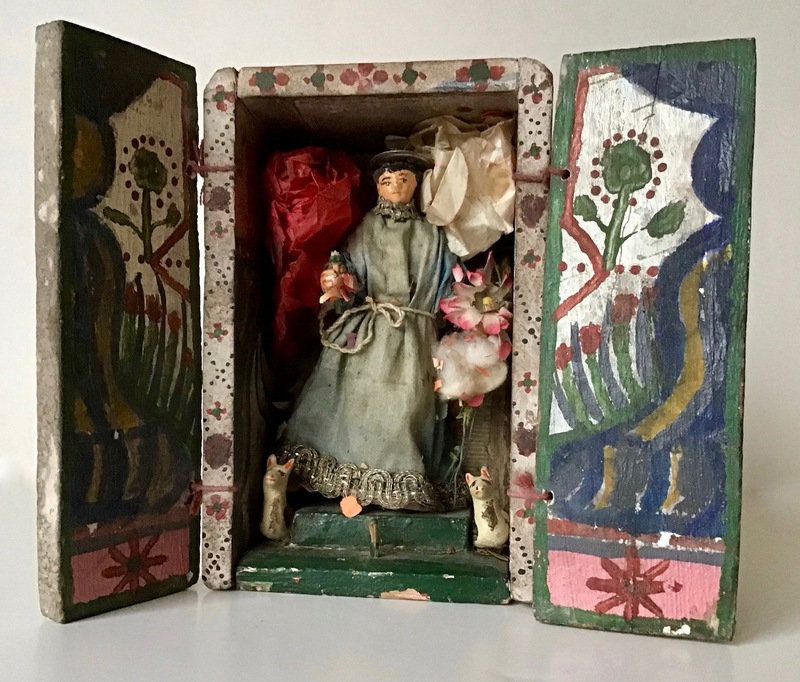 This stunning antique piece (see next image for a different view) is a portable altar /Oratório de Viagem which the traveler, often a person traveling on business, would take with him and set up in his temporary accomodations in order to say his daily prayers. It thus functions as a temporary version of the typical household altar popular in Latin America. This particular traveling altar (ca. early 20th century) was collected in Pernambuco in Brazil's Northeast. 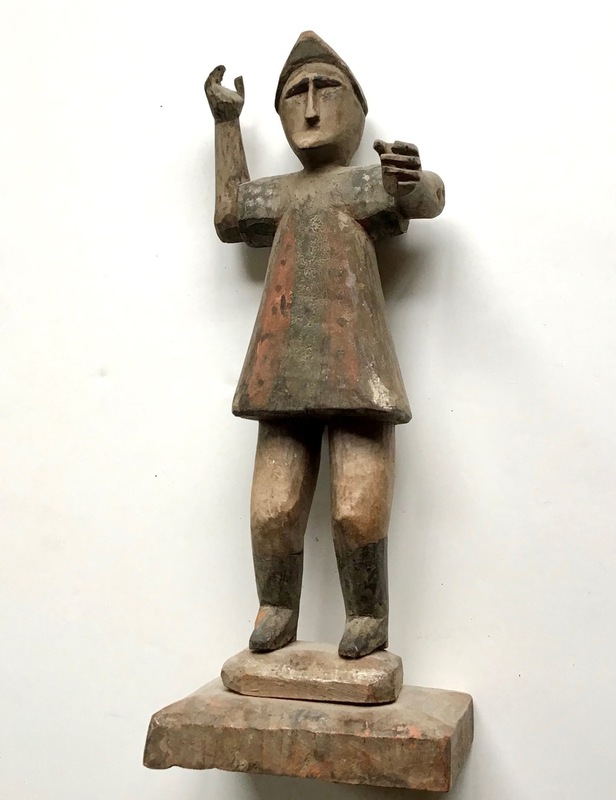 It is both a superb piece of sacred and and of Brazilian folk art from this region. 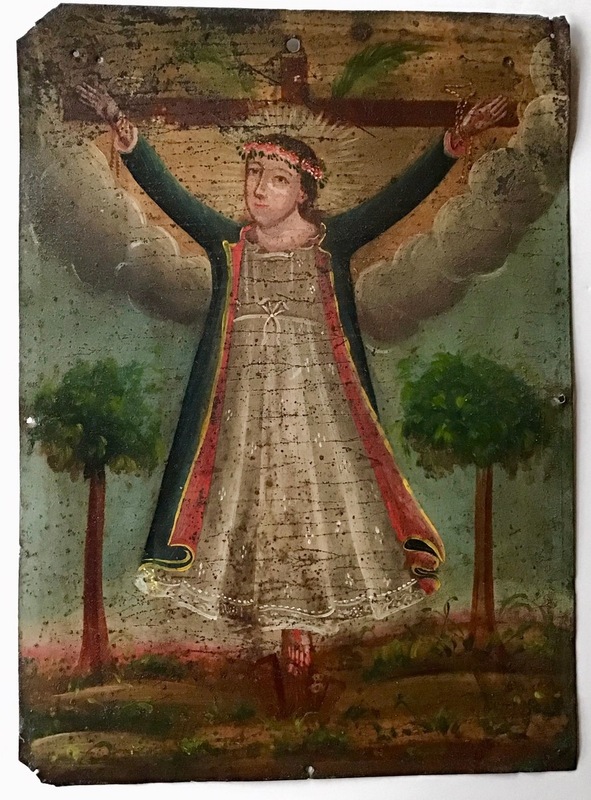 “All over Latin America, there is a sacred geography, known mainly to the faithful.” (Marion Oettinger, curator, “Visiones del Pueblo – The Folk Art of Latin America”, exhibition catalog, p. 29) Throughout Latin America, much of the folk art reflects popular expressions of faith. It is almost impossible to view Latin American popular art forms outside a religious or spiritual context. In many regions where the way of life is still pre-industrial, but also in urban areas, religious faith serves to make sense of the general order of things, to cope with adversity and provide a refuge from hardship, death, disease, accidents. 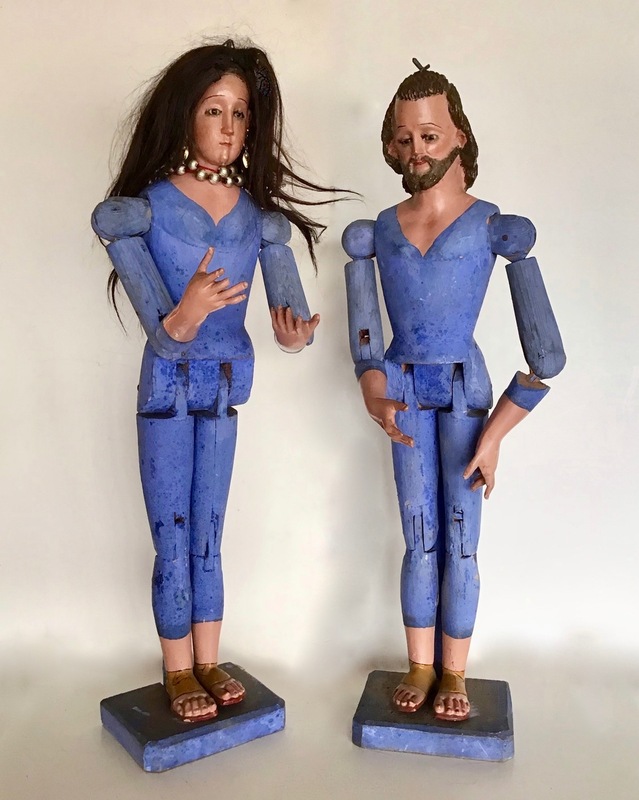 Often created by indigenous or non-European artists but based on European colonial models, carved and sculpted saints, santos or bultos, virgins, Christs, nichos (traveling or household shrines), retablos, milagros, ex-votos and religious paintings have provided believers with tangible symbols of their Catholic or syncretic faith. 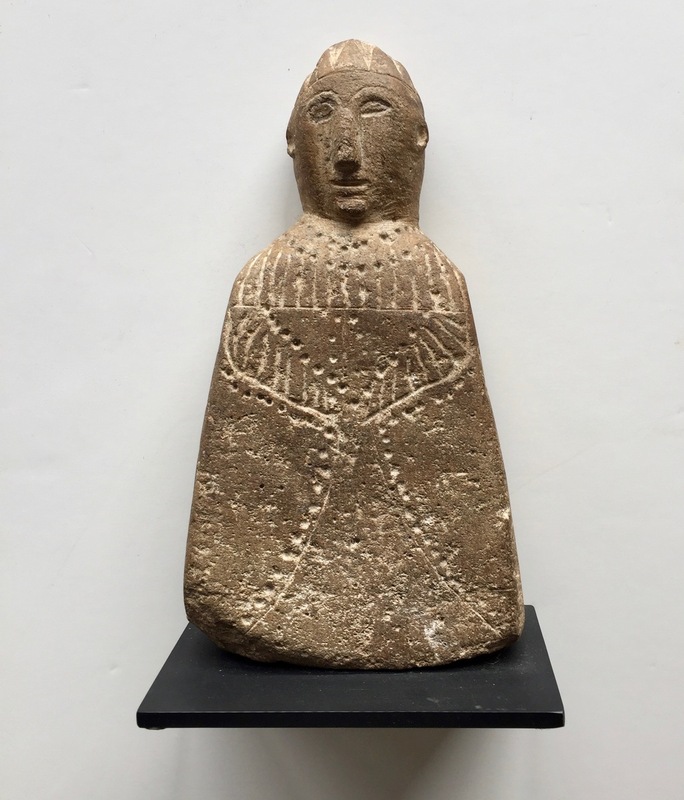 This was, and in many places continues to be, the case especially in rural areas where religion is often of a homemade variety incorporating pre-Hispanic or non-European belief systems and aesthetics. 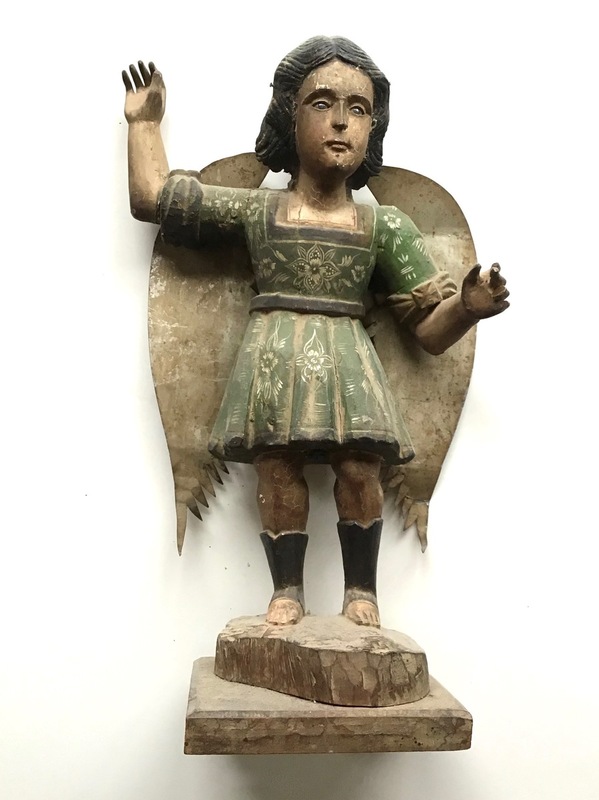 The MARIPOSA collection features many outstanding examples of Latin American sacred art from various different countries and cultures. More pieces are available than shown in this portfolio.